ABOVE: Drawing of "Austrian" pattern anvil in Otto Schmirler's Shop from Werk und Werkzeg des Kunstschmieds and photo of a similar old anvil. Notice the tall rectangular waist and the gently curving heel with narrow edge. 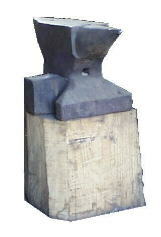 The Otto Schmirler anvils are cast steel but the old anvil above is probably a forging. 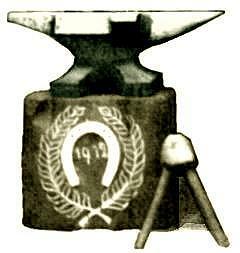 Cast anvils generaly do not become so gracefuly swaybacked from use. 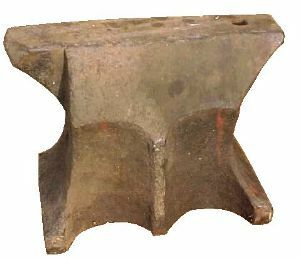 ABOVE: Modern cast steel anvil of similar pattern. Sadly the pattern maker missed the fine design points of the original. Notice the heavier heel and the cutout in the waist under the heel breaking the straight vertical line. The "church windows" do not continue to the base and extend above the line between horn and heel. The base is also considerably narrower than the classic pattern and the overall proportions are shorter. Also notice that the hardy hole is further out on the heel where it has less support. This is both good and bad. The good is that it leaves more open space on the face of the anvil. It is also easier for the foundryman to make the shorter cored hole. What is bad is that it is not nearly as solid a place for tooling as when supported next to the body. The thick heel is also a cast anvil convention, the pattern maker worrying about strength. German Double Horned Anvil in Josh Greenwood's blacksmith shop. 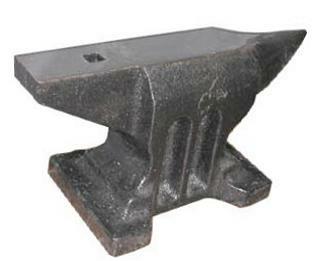 This 450# forged anvil was purchased in Germany. 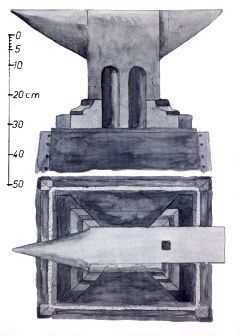 It is the anvil featured in the scale drawing below. EuroAnvils referenced this drawing to make their "Euro Anvil" Click for full drawing. 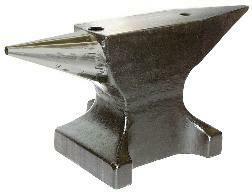 The Peddinghaus is similar to the classic double horned German anvil but does not quite have the classic lines of the old forged anvil. The "classic" anvil shapes are like other things that the patterns were perfected long ago. Like the pattern of the Stradivarious violin and the English leg vise these designs were perfected many years ago and should not be deviated from without much study. Differing from these patterns is always a gamble and should be considered carefully by manufacturers. What the Peddinghaus loses from the clasic style is a distinctive style of its own. It has a wider body and large base making it a very steady solid anvil. LEFT: 1912 German double horn with side clip and sloped edge. Detail from Gill Fahrenwald 2006 Military Blacksmiths Calendar, September. anvilfire Anvil Gallery : Old no-name German anvil with sloped size and clip. A clasic shape from the region. RIGHT: Antique German (or French?) 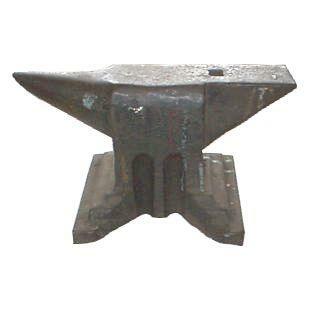 Hornless style anvil. These were popular throughout Europe and the style dates at least from the 1600's. Bernard Tappel's shop, BAM. LEFT: It has been speculated that this is an armorer's pattern anvil and that the flat back side is so that it can be laid on its side and the "church window" depressions used for forming curved items like arm and leg armor. It also sets on end so the large radi can be used. 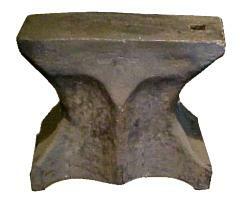 This is another anvil pattern with clean classic lines that appear to have been developed over a period of time. From the Josh Greenwood collection. Selecting an Anvil Which is right for you? 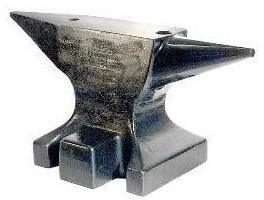 Types of anvils. Rare and ancient European and Early American anvils. Return to the Anvil Gallery index.